The Alaska Volcano Observatory said Tuesday night's eruption at the volcano about 60 miles west of Unalaska, which began just after 10:30 p.m. and lasted for 73 minutes, sent a plume to an altitude of 34,000 feet. By midday Wednesday, a lack of further activity caused AVO to lower Bogoslof's aviation color code to "orange" and its alert level to "watch" — down from the more severe "red" and "warning" levels. Staff cautioned in an update that "(a)dditional ash-producing eruptions could occur at any time, however, with no detectable precursors." Hans Schwaiger, a geophysicist at the observatory, said a pilot spotted ash from the eruption Tuesday night. Although Bogoslof's last previous eruption was March 8, Tuesday's blast is still part of the same eruption cycle that began at the volcano in mid-December. "Each of these eruptive cycles can be months to many months," Schwaiger said. "It wasn't the strongest of the eruptions in this sequence." The ash plume passed over the west side of Umnak Island headed southwest, Schwaiger said. Firefighters in Nikolski, on that island about 116 miles west of Unalaska, confirmed small amounts of ashfall reaching the community Tuesday. No damage was reported, and no further ash had fallen Wednesday. The National Weather Service's Alaska Aviation Weather Unit had been tracking the ash plume at an altitude of 34,000 feet, but unit meteorologist Mitch Sego said Alaska-based ash advisories had been canceled by 10 a.m. Wednesday. Schwaiger said another volcano in the Aleutians, Cleveland Volcano about 25 miles west of Umnak Island, erupted slightly earlier than Bogoslof at about 7:15 p.m. Tuesday. That blast sent up a lesser ash plume, which headed southwest over the Pacific Ocean. "There was a pilot report that said nothing was observed so we didn't think much of it, but later on satellite images we saw a plume that extended to about 15,000 feet," Schwaiger said. 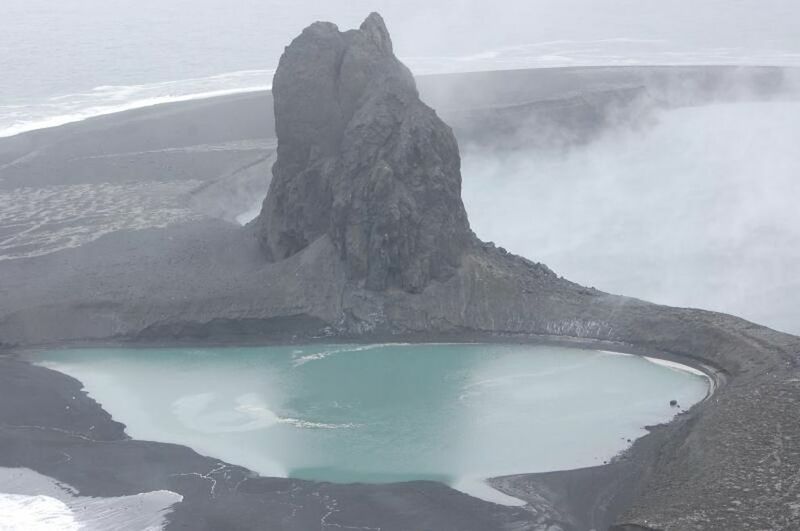 Chris Waythomas, a geologist at AVO, said Bogoslof Island's continuous reshaping by the eruptions has produced a lake at the center of the island. Its steaming waters were seen by observatory staff last week, during a visit to Bogoslof by a U.S. Coast Guard helicopter crew. Satellite images showed the lake at temperatures above those of ambient waters in the area, Waythomas said, but its exact temperature wasn't clear. 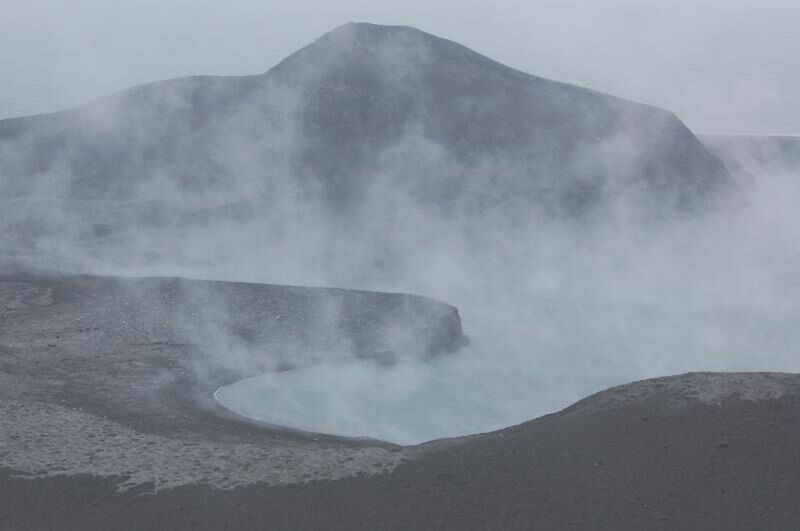 Other scientists have previously reported similar lakes at Bogoslof hot enough to scald fur seals. "There's magmatic heat down there somewhere that's rising and keeping that lake warm," Waythomas said. "It's possible that there's some kind of a lava dome at depth that hasn't made it to the surface yet or it could be gases bubbling to the surface." Fur seals and Steller sea lions are currently visiting Bogoslof, one of their traditional pupping grounds, and Waythomas said the recent eruptions aren't likely to affect that trend. "The Bogoslof population's pretty robust," Waythomas said.